Would you try these puppy shaped puddings? 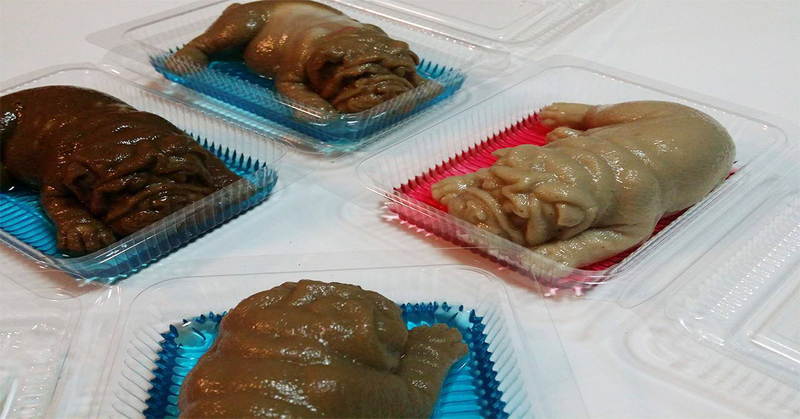 Photos of a slimy and puppy shaped pudding from a Thai dessert shop are going viral on the internet, making netizens cringe at the sight of these photos on Facebook. But, not to worry. Though they are shaped like a realistic puppy, they do not contain any pooch parts and are still regular coconut puddings that are usually flower shaped. The pudding is made of cream and no animals were harmed in the process. Willaiwan dessert shop in Pathum Thani shared the photos of their newly moulded puppy pudding on facebook, gaining them nearly 10,000 shares within the next six hours! Some of the netizens that saw the photos commented that they would not eat these puppy shaped pudding because it feels as though they are eating their own pets. Well, no thank you. It looks too realistic. However, the shop owner of the Thai dessert shop says that these puppy shaped pudding were a big hit. In a two-story house in Pathum Thailand, these puppy pudding were crafted by hand in the hands of the shop owner. Before becoming a viral hit, her husband and her were just ordinary couple working 9-5 jobs selling normal puddings to earn the extra income. How the puppy pudding business came about was that the shop owner, saw a trend of puddings shaped in many different and exciting shapes. Then, she came across a puppy mould and decided to give making puddings shaped as a puppy a try. Who knew it would go viral. Since then, Willaiwan dessert shop has been receiving many orders that can not be made within a month. They have been selling the puppy-shaped puddings online for 4-5 months. If you are interested in trying these puppy shaped puppy, you can place an order with them on their facebook page. However, be prepared to wait…. for a long time as you will have a long queue.